Thank you guys for all the awesome encouragement you shared on this quilt, it was so amazing to hear what you all had to say. I'm so glad I kept going with this quilt because I am just in love with how it turned out. This is going to be a hard one to give away, but I'm really excited to ship it off to Kayla. After I quilt and bind it, that is. The quilt top is totally finished, and I have all of the fabric for the backing and the binding. I think that I'll be spending my first official FNSI quilting this quilt. I am totally undecided on how I'm going to quilt this one, though, and I'm open to suggestion! I wouldn't be surprised if I found myself making another drunk love quilt someday for my house - my husband gave this quilt a pretty high compliment..."It would be really awesome if it weren't for all of the pink." This quilt was really fun to put together, I loved the freedom of putting the pieces together in such a random and completely different kind of way. I wasn't sure if my usually organized, rule-following self could enjoy a whole quilt like this, but I really did. It was a perfect relief from my Single Girl quilt (which happens to be moving moving along again, btw). 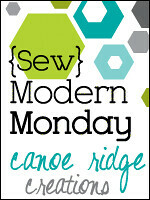 I'm sharing this quilt top over at Sew Modern Monday hosted at Canoe Ridge Creations. Hop on over to see some other modern fabric finishes and have an awesome day!